In today's Speak Up on Kotaku side-story tailored especially for beginning readers, commenter Daemon_Gildas suggests Square Enix tap the most reviled entry in the storied Final Fantasy series for its next all-star fighting tournament. 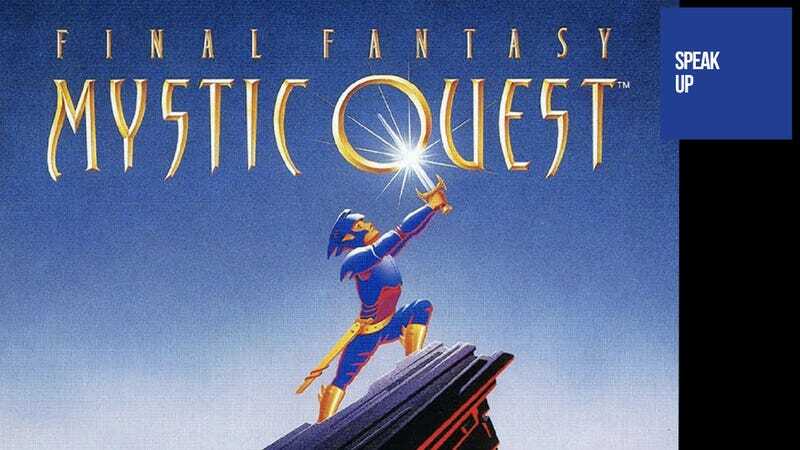 Man, if Square Enix ever does another Dissidia game, I *REALLY* hope they bring in Benjamin from Mystic Quest. For one, the music in that game is possibly the best in the series (although it's obviously a very different style, so not to everyone's liking). Actually, that's really about it. I'd give him a personality like Zack Fair, though, and make him the easy-going, "class-clown" type of character. In fact, I'd probably play his humor up even more, and of course he would require the infamous "Shrug of Justice". Just me sure to base him on the US box-art. Even if you ditch the sweet-looking helmet, I just like that general design.